This year St. Patrick’s Day falls on the best day of the week, Friday! So everyone can enjoy the day without the worry of having to get up early the next day. 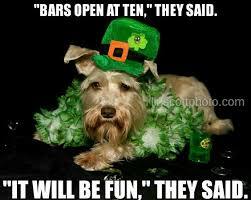 Here at My House-Ne we have done some research for special offers for you to enjoy St. Patrick’s Day to the full. On Friday, a Mass will take place at St Michael, off Westmorland Road, at 10.30am, followed by a Tyneside Irish Brigade remembrance event at 1pm at the Old Eldon Square War Memorial. As you’d expect the city centre is making a full weekend of it. They’re starting the celebrations early on tonight with a ceilidh from 8pm. Featuring the Newcastle University Irish dancers, this marks the start of its St Patrick’s weekend and will have guests stomping along until 10.45pm. The cost will be £3 on the door. On the menu is plenty of live music, hats, scarves, flags, pots of gold, leprechauns and £2 pints of Guinness. And if that is enough to whet your penny whistle the best bit is it’s free entry! DirtyPOP is going to be the place to be! Cheap entry, cheap drinks, bouncy castle, anthems and a night to remember! The Newgate Street bar is hosting Let’s Get Folked, where you’ll be able to kick back and enjoy music from an Irish folk duo. You’re bound to hear plenty of B*Witched, Westlife and Boyzone at the famous bar at the bottom of the Bigg Market. If you go wearing green you’ll get a free shot of Apple Sourz. You can party in honour of St Patrick with Paddy Cocktail Steins for £5, free Paddy’s shot and free entry in fancy dress. £5 steins with vouchers, music from Uber Oompah and Filling Frankfurters are on the menu at the Bigg Market bar. Get in the spirit at the Pudding Chare bar with £2 Baby Guinness shots. The famous bar, just off Northumberland has a very tempting St Patrick’s Day meal deal. The offer, which comes in at £9.95 includes an authentic home-made Irish stew served with crusty bread, a premium pint of Murphy’s Irish Stout as well as a Jameson’s Irish whiskey chaser. A Shamrock Stage will be set up at The Monument on Saturday where people can watch Irish dancing displays. From 12.30pm until 3pm these will be accompanied by Comhaltas Ceoltoiri Eireann musicians followed by a performance by Liam Turner and Jim McCloskey. Head down to Osborne Road this Friday for an all day party at Spy Bar to celebrate St Patrick’s Day. Just over the road from Spy Bar, another all day party will be buzzing at gastro bar 97 & Social.